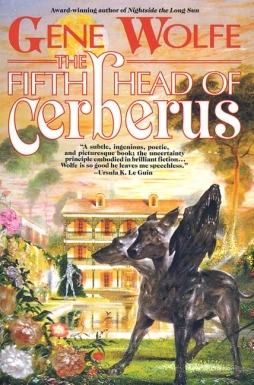 Reading The Fifth Head of Cerberus, I was struck by the way the book seemed eminently suited to the internet age. Never mind that it was written in the early 1970s. Like many of Gene Wolfe’s fictions, it’s a text whose nature is in harmony with the way the internet allows a text to be scrutinised; its depths, its meanings, its allusions — or at least some of them — can produce multiple readings, any of which can be valid, but which deepen the work as a whole the more of them you can think of and hold in your head at once. And can any one reader imagine as many different readings as a community of readers will produce? The internet’s helped change the way an audience interacts with a story. Fan communities discuss and break down details on blogs and message boards; it’s most obvious with TV shows and serialised comics, where analysing past stories may help predict future plot developments, but it’s there also for stand-alone narratives like movies and novels. To an extent it was always there, whether in the form of literary criticism or of things like fanzines and APAs, but the internet’s made that degree of interaction and communal scrutiny far more common. On one level it’s obvious why Wolfe’s writing thrives under this sort of analysis. A typical Wolfe story will seem simple on the surface, with a few odd gaps or apparent contradictions in the narrative; but, when investigated, those gaps or contradictions will seem to suggest a different way of reading the story, suggest that what’s actually happening is something larger and perhaps more disturbing than what appears to be going on, suggest perhaps that the story that’s actually being told is completely other than it appears at first glance to be. A lively critical community — and Wolfe has an active mailing list and a wiki dedicated to his work — can help unpack these subtleties, and clarify some of the possibilities confronting the reader. The Fifth Head of Cerberus, though, is an example of how a community of readers can be even more useful. Where a series like The Book of the New Sun may be filled with secrets, The Fifth Head of Cerberus seems to me to be filled with different possibilities. It’s a combination lock of a story, whose component parts can each be given different values, and which therefore produce different readings as the different values come into alignment with each other. Secrets can be told, one person to another or one to many. But the many combinations of The Fifth Head seem to grow as multiple readers outline and debate the multiple possibilities. The book is made up of three novellas, all set on a pair of colony worlds, Sainte Croix and Sainte Anne, at some point in the future. Originally settled by the French, the current regime (human, but of what culture is not stated) conquered those first colonials some time ago. One of the worlds, Sainte Anne, seems to have had native intelligent life, which survived by adapting itself to the human colonists — by becoming human, infiltrating and perhaps assimilating the settlers. The first novella, “The Fifth Head of Cerberus”, introduces us to the setting through the recollections of a young man, the scion of a whoremaster who runs a high-class brothel on Sainte Croix. The second, “‘A Story,’ by John V. Marsch”, is apparently a reconstructed or reimagined myth of the aboriginals, written by a minor character from the first story. The third novella, “V.R.T.”, presents us with an official trying to decide on the fate of the second story’s author, now in prison, as the official reconstructs the man’s life from tapes and journals. As stories, they’re very different reading experiences. Stylistically, they vary considerably, one to another. The first is a stately memoir; the second a flat, almost fairy-tale-like narrative; the third a jigsaw puzzle of fragments out of which the outline of at least one story slowly emerges as the pieces seem to slip into place. In all of them the language is precise, every word carefully-placed. And they each seem to connect to the others in different ways, suggesting new interpretations of events. Small details of dress or physical description may link characters, identifying unnamed individuals, establishing that someone who appears briefly in the first story recurs in the third. The possibility is raised that all the apparently-human characters are actually aliens from Sainte Anne; then that the aliens are actually descendants of much eaerlier human colonists; and these ideas interact profoundly, asking that the whole book be read and reread in light of these suggestions. The book as a whole seems to be about identity, and the nature of identity, and how one grows into a possibly-predetermined identity (and the violence that process entails). So the confusion of identities becomes significant thematically as well as on a plot level. The point is that the small details change the story significantly. And they are small details; unobtrusive, unrepeated, but there if you go looking for them. Wolfe’s not interested, in this context, in creating a pattern of imagery; nor even precisely with creating a web of references — though the details do create a web of meaning, or several possible webs, if you try to put them together. He’s throwing in points weighted with potential significance, each of which can change the reading of a given text within the three-novella sequence as well as how that text relates to the other texts. Here as elsewhere, Wolfe is a writer concerned with what is not written. He’s a writer of lacunae, of gaps in perception; a typical Wolfe character won’t notice certain things, and won’t notice not noticing, but will provide just enough hints that the not noticing becomes noticeable. A Wolfean narrator may be unreliable, may forget things (deliberately or not), and, as is potentially the case in at least one novella here, may not be the person he imagines he is. Wolfe is acutely conscious of the particular perspective his tale-tellers have, and often writes a story that shifts depending on that perspective and what it allows the character to see. If the narrator changes, that perspective changes, and the shadow-story changes with it. 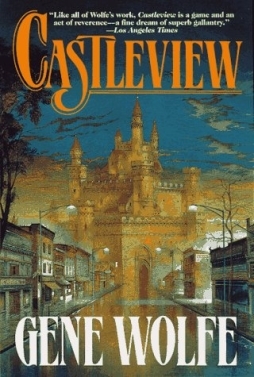 A novel like Castleview seems to be all about perspective, telling a story that perhaps nobody grasps in every detail; every character sees something different when they look at the events that make up the tale. Like The Fifth Head of Cerberus, though perhaps not to the same extent, it suggests multiple readings. Wolfe’s mastery of technique and structure is irreproachable; but I think there are risks in what he does. I think some of his stories, even the widely-praised “Seven American Nights”, may suffer from a lack of definition; nestled within multiple frames, with narrators holding secrets or lapsing (unknown to them) into hallucination, a Wolfe story may become simply too open to interpretation — ultimately meaning nothing. The allusions become too opaque, interfering with basic comprehension rather than opening up new vistas of possibility. At worst, the narrative thrust may be blunted. Even parts of the latter two novellas of The Fifth Head of Cerberus come to feel less like stories and more like puzzles. You read them for the dexterity of the writing, not because the characters grip you or you wish to find out what happened next. But then, stylistic skill is as good a reason as any to keep turning the pages; you could say that when the storytelling momentum flags, Wolfe’s way with language is enough to keep you reading. Ultimately, technique is only a means to an end. 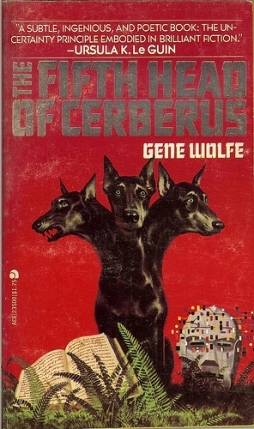 The Fifth Head of Cerberus is important, as Wolfe’s best work is important, because the technique is the best way to express the theme. In a story about the uncertainty of identity, the uncertainty and multiple possibilities of Wolfe’s allusions make the point live in the process of reading. Identity is multiple just as the possible meaning of the texts are multiple. Which brings me back to my main point: a community of readers produce multiple readings, any number of which might be valid. Wolfe’s stories are best read thinking “both/and” instead of “either/or”, and the online community increases the number of “and”s available to you as you read or reread. 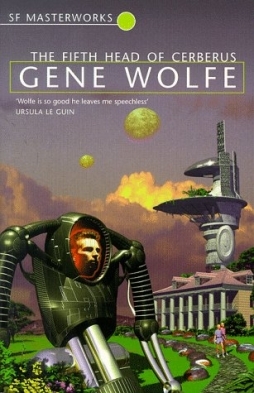 Which is what I mean when I say that Wolfe’s a writer well-suited to the internet age, and The Fifth Head of Cerberus a good example of why. Wolfe’s defined “a great story” as one that “a cultivated reader can read with pleasure and later reread with increased pleasure.” His work fits his own definition, demanding to be reread and unpacked, so that understanding can deepen, so that multiple perspectives can develop. So that you get more pleasure out of the rereading than the initial reading. The puzzles of a text like The Fifth Head of Cerberus are near-endless; as a result, the pleasures of rereading are near-infinite.